2nd February 1917, aged 33. Charlie Ackling was badly wounded by a High Explosive shell close to a place called 'Yarra Bank' near Switch Trench, Bazentin-le-Petit. He was admitted to No.45 Casualty Clearing Station at Dernancourt on 29th January 1917 with penetration wounds to his right lung and also his left thigh. He died of his wounds on 2nd February 1917. 2nd April 1918, aged 40. Son of John Henry and the late Mrs. Astridge; husband of Emily Astridge, of 4, Kerrs Rd., Lidcombe, New South Wales. Native of England. 9th March 1917, aged 33. Son of William and Annie Maria Atkinson. Native of Eden Valley, South Australia. 6th February 1917, aged 29. Son of John and Susan Bower, of Harriett St., Wallsend, New South Wales. A lift electrician prior to enlisting in November 1915, Pte Bower embarked from Sydney with the 10th Reinforcements on board HMAT Orsova (A67) on 11 March 1916. He arrived in France for service on the Western Front on 18 May 1916. 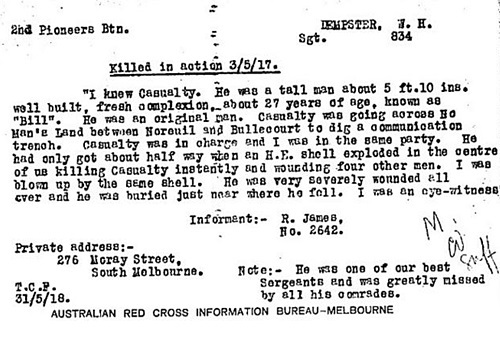 On 4 February 1917, Pte Bower was seriously wounded during an aerial bombing attack near La Sars, France. He was admitted to No.45 Casualty Clearing Station in nearby Dernancourt on 4th February 1917 with a bomb wound, penetrating the abdomen, he died of this wound two days later on the 6th February. 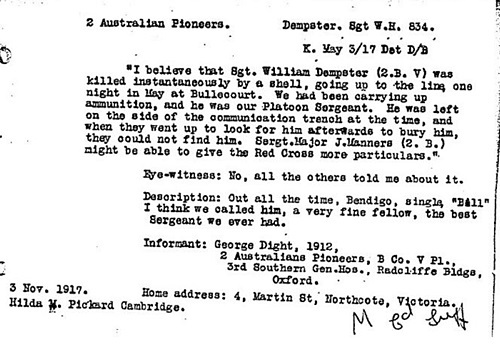 Pte Bower was 29 years of age. 3rd March 1917, aged 21. Son of Edward Foster Brady and Ellen Adelaide Brady, of 116, Grosvenor Rd., North Perth, Western Australia. Native of South Australia. Between 26th March 1918 and 27th March 1918. 5th April 1918, aged 27. Son of John Pickford Clarke and Mary Elizabeth Clarke; husband of E. M. Clarke, of Atkinson St., Liverpool, New South Wales. Native of Quirindi, New South Wales. 11th December 1917, aged 26. Son of Sarah Angwin (formerly Cornell), and the late George Cornell; husband of Jessie Millicent Cornell, of Lindisfarne, Tasmania. Native of Richmond, Victoria, Australia. Son of Mrs. Margaret Arm Pomroy, of 5, Harold St., Burnley, Lancs. Son of Hugh and Catherine Dempster, of Diamond Hill, Bendigo, Victoria, Australia. Pictures and text courtesy of Kim Crowe, first cousin, twice removed.